Hi my name is Natasha and I've been working in the veterinary industry for over 7 years doing a variety of roles including reception duties, nursing and management. 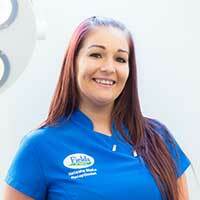 I have recently joined Fields Vets as a full time receptionist and I love it! I enjoy being able to talk to our clients and fuss all their pets. I have two Boxers myself, one called Junior and one called Chance who I absolutely adore.